Cars are a necessity, and we go through many of them in our lives. No matter if you’re an enthusiast or directly driving to get from A to B, sooner or later your car will reach the end of its life. As with us, cars or trucks get old in a blink of an eye and disposing of a vehicle is always disheartening as we think back on the memories we had in it. It is wise to give your car the final rest by knowing it is disposed of responsibly at a car recycling facility. So why is car recycling so crucial in Australia at the moment? Statistics show that there is an average of more than two cars per household. Numerous old and unwanted vehicles require disposing of for recycling. Otherwise, it can become hazardous to the family and the environment. Through a car recycler, the steel from the parts can be reused for another purpose; you are helping the environment, help to reduce landfill and supporting the need to mines for new Steel. You will also benefit from some extra cash and boost the economy by getting rid of old vehicles sitting around and improving the appearance of your home or business. Ultimately, we must make sure the cars are recycled in the right manner. Thus we make it simple, by offering top cash for unwanted cars and we make sure your car is recycled instantly and responsibly here at Wreckery Car Wrecker. At Wreckery, we offer free quotes for any car recycling in Brisbane. Firstly, we will need some information about your unwanted vehicle. Which you want to recycle such as make, model, year and condition. Second, our professional staff at Wreckery will evaluate your car and provide you with the best quote instantly. Finally, if you are happy with our quote, we will set a time and a place to pick up the car with our tow truck. With a fleet of 10 tow trucks, we are a fast and comfortable car removals service provider and number one auto recyclers in Brisbane. Everything is done fast and easy, hassle-free. We provide same day pick up and cash on the spot. Why Choose Wreckery For Auto Recycling? We are known for results and looking forward to helping all our customers. Contact Car Wrecker Today! WHAT ARE YOU WAITING FOR? THIS IS HOW SIMPLE IT WORKS! We will complete all the paperwork for free, pay you the quoted cash on the spot and tow away your old car. We accept all types of vehicles including sedans, hatches, station wagons, utes, 4x4s, pickups, trucks, and caravans. Also, We will pay for all makes and models like Nissan, Skoda, Jeep, Suzuki, Toyota, Landrover, Nissan, Honda, BMW, Mazda, Mercedes, Isuzu, Fiat, Benz, Audi, and more. 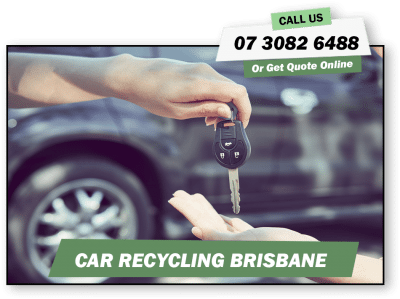 Being the most trusted and reputable car recyclers in Brisbane, Wreckery follows a strict eco-friendly car recycling practice. Taking great care in proper recycling, safely disposing hazardous materials from vehicles, such as oil, coolant, brake fluid and air conditioning gases that are harmful to the environment and humans are our priority. To prevent harmful leaking acid – 99% of batteries can also be recycled to manufacture new Batteries. We offer you the best quote on old and rusted vehicles. We buy and resell some of them mostly for their working parts to reduces a massive burden on our fragile environment. Cars we come by are mostly hard-to-sell cars while others are the ones where owners find it too expensive to repair them or don’t have the time to dispose of for recycling. We understand our customer, so we PAY MORE to our valued customers! Registration is preferred but is not a requirement. All you need is to provide us an ID such as your driver’s license. If you are unsure, feel free to inquire from our team, and they will guide you through the process. Call for a quote on 07 3082 6488 or submit an online inquiry. You can check out these links below for more information about car recycling. Working Time "Open 6 Days"
How To Find The Perfect Tire For Your Vehicle? What are the factors that have an impact on the trend of Automotive Industry? 5 Tips – What To Do In Case Of An Accident?